A senior researcher discusses extinction due to global warming in this two-minute sound segment. He says that as climate warms, species will probably move upslope and towards the poles but in many cases, that may put species that are found on mountain tops at risk. Species with small ranges or lowland species that may not be able to get to mountain slopes and find equitable climate will die out. His study suggests that as many as one million species of plants and animals worldwide could be facing extinction as a result of climate change. 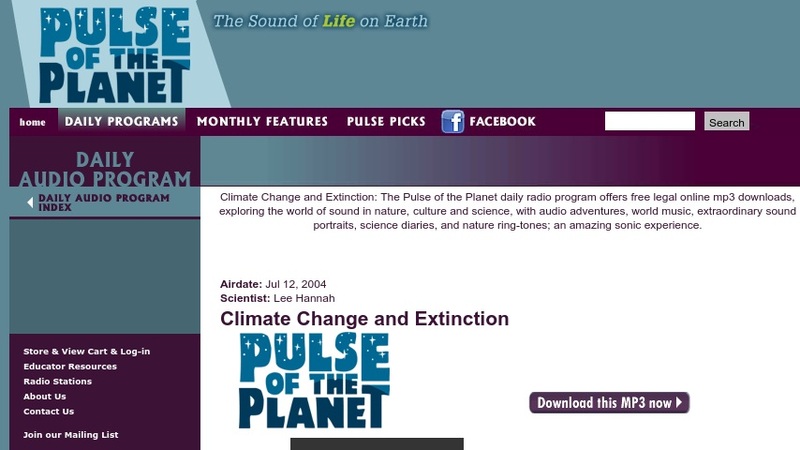 This site is from an archive of a daily radio program called Pulse of the Planet, which provides its listeners with a portrait of Planet Earth, tracking the rhythms of nature, culture and science worldwide and blending interviews and extraordinary natural sound. The site also provides a written transcript of the broadcast.